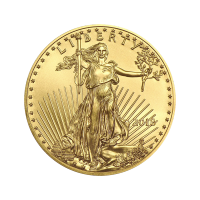 1/2 oz 2018 American Eagle Gold Coin | ?? 正面 Rendition of Augustus Saint-Gaudens Lady Liberty, and the words "LIBERTY 2018"
反面 A male eagle carrying an olive branch flying above a nest containing a female eagle and hatchlings and the words "UNITED STATES OF AMERICA 1/2 oz. Fine Gold 25 Dollars" and the phrases "e pluribus unum" and "In God We Trust".